Designed for a tight-knit family of musicians, the Unbridled Path home encourages play, creativity, and connectivity by illuminating the power of natural light. When a family of musicians was looking to build a new home in the charming town of Rothesay in New Brunswick, Canada, they yearned for a place where they could easily connect with one another, as well as with nature. They also wanted their home to feel spacious and expansive, a type of setting that would inspire fresh thinking, open-mindedness, and encourage musical collaboration. 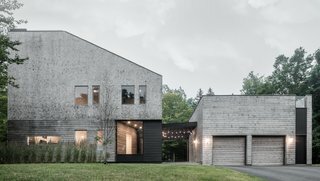 To help bring this vision to life, the family partnered with Acre Architects, a Canadian–based firm known for its unique Storied Architecture design approach. Combining strategic architecture with environmental psychology, the team harnessed the power of light to encourage a strong connection between physical expanse and creativity. Entirely clad in cedar shingles, the Unbridled Path residence is both familiar and contemporary through its use of materials and proportions. It was inspired by the typology of an iconic nearby family estate. While the property’s dynamic, sculptural form effortlessly integrates with its surroundings, one step inside immediately reveals the break from tradition. 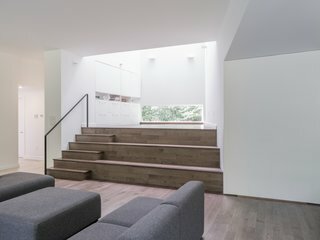 While many homes are centered around the kitchen, the unique plan of the Unbridled Path residence surrounds a stage within a 34-foot-tall light well, incorporating seating for visiting friends and family that sprawls out to the open communal spaces. This residence is centered around a 34-foot-tall light well, which floods the home with warm natural light. In the summer, this area is transformed into a heat chimney by drawing warm air up to the operable skylight. Cooler air flows in through the glazed windows at the garden level, blending beauty and sustainability. "The cavernous space derives its drama from the dynamic play between natural light and the shadows cast along its minimalist white walls," explains Stephen Kopp, co-founder of Acre Architects. "Here, light becomes materiality." The architects thoughtfully designed the top of the stage with their clients' interests in mind, including a place for impromptu jam sessions, as well as an open play area for the couple’s three young children. Naturally lit from the light well above, the wooden stage overlooks the living, dining, and kitchen areas on the first floor, further exploring the dynamic spatial relationships that this contemporary, 2,710-square-foot home fosters. At the bottom of the 34-foot-tall light well sits an airy, open stage, which is a beloved spot for the family of musicians. 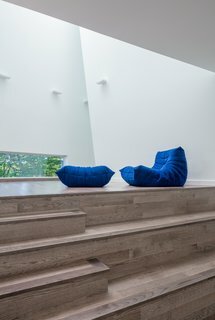 "While the stage easily acts as a place for performance—from hosting a jam session to children’s impromptu concerts, it can also double as a seating area for the living room," notes co-founder of Acre Architects Stephen Kopp. "We were part of a lecture that the client gave from the living room, and it really felt like an intimate fireside chat." While the open floor plan helps the family stay connected to each other, the design of their residence also fosters another important connection: with nature. With an 11-foot-tall, floor-to-ceiling window wall of Marvin Wood-Ultrex® Windows along the full length of the house, the home beautifully frames the lush forest in the backyard—breaking down the division between interior and exterior space. This type of biophilic design is not just aesthetically pleasing. According to various studies, it has also been proven to have a wide range of other benefits, including increased concentration, productivity, and creativity, which is exactly what this family had in mind. 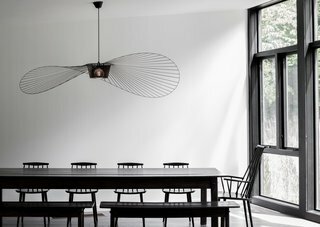 The abundance of natural light drifting in from above is enhanced in the first-floor communal areas, where the architects integrated an 11-foot-tall, floor-to-ceiling window wall along the full length of the house. "Acclaimed for their high-quality products, Marvin offers the durability this home required," states Kopp. "Since this house was built to be regularly full of people, it demanded a product that could withstand the repeated use of its operable functions, seamlessly moving from inside to out. The windows in this project needed to not only deliver this strength, but also to maintain the standard of the building quality throughout the neighborhood." "More so, this house used light as a material, and Marvin delivered on this being possible," Kopp adds. To expand the family’s sense of surrounding space (a strategy known to improve creative thinking), Acre strategically widened the interior space beyond the home’s enclosing walls via large windows and doors. With Marvin floor-to-ceiling windows incorporated throughout, the home not only blurs the barriers between inside and out, it also fosters a deeper connection to nature. Thanks to this partnership, the team tapped into the power of natural light to create a home where their clients could ultimately live better, a main ingredient to the firm’s design approach. As Kopp concludes: "Living better for this family translated into being a space that enabled creating memories with loved ones and encouraging a sense of play for kids and parents alike, all while living a healthy life connected to nature."